Leon Neyfakh's book about the life of struggling artist and rapper Juiceboxxx. 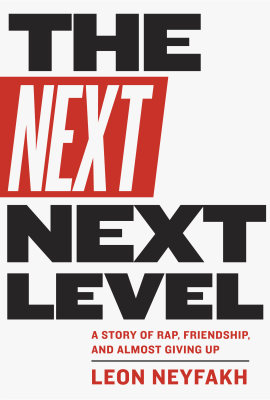 Leon Neyfakh’s debut The Next Next Level will resonate with anyone actively pursuing a creative career (or even a creative side-career). Part-memoir and part-artist profile, Neyfakh follows obscure rap-rock artist Juiceboxxx as Juice comes to a crossroad in his almost-30 life — should he settle down with a full-time job, or should he keep struggling to make a living off of his art? Is he even talented enough to make it as an artist? Can extreme passion make him successful, even if his talent is questionable? What if you will never be able to make a living off what your passion? All of these underlying questions — ones that all “creative types” grapple with at some point in their lives — come up in some form in Neyfakh’s book. Juiceboxxx and Neyfakh have known each other since they were teens growing up in the Midwest. In his book, Neyfakh even recalls in detail the very evening he was first captivated by Juiceboxxx’s rambunctious performance at a dank basement show. After staying relatively in touch into their late 20s, Neyfakh approaches Juice and asks if he could write a piece about him (first for n+1 and later, in book-form). Throughout the process, Neyfakh analyzes his own self, wondering what makes him fundamentally different from Juice when it comes to passion, creativity, and drive — the idea of chasing after an ambitious dream and having nothing stop in the way. In one particularly sweetly sad scene, a teenaged Neyfakh recalls playing an EP cassette tape he recorded with his acoustic guitar for his father. His father quickly (but thoughtfully) shoots down the idea that Neyfakh should get into music — just because he’s a fan didn’t mean that would ever make him into a good musician. Perhaps this book is essentially about the grass being greener on the other side — how Neyfakh seemingly wishes for a more creative fulfillment, and how Juiceboxxx needs financial stability to the point where his rap-rock endeavors may come to an end. They may secretly be envious of what the other has (even if it’s down to certain personality traits), but they know they are each so inherently different that they can’t imagine trading in a life for what the other has. We all know that many creative dreams are eventually hung up to dry and shrivel into a slow death, especially if you can’t make money. But reading The Next Next Level leaves me to ponder that time-old hypothetical question: If the opportunity came along to, say, leave a stable job and take a wild risk at forging the creative life you’ve always wanted, would you take the leap or regret forever never taking it?